Spent the day working the booth at Monticello. While I was there I realized that we moved in there last August so it is our one year anniversary. Wow, did that go fast. We have been having so much fun and just love that place. Here are some pictures I took of our booth. 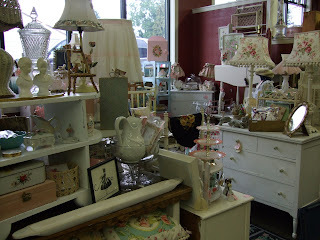 As you can see, we have a lot of cottage style furniture, lamps and vintage decor items. 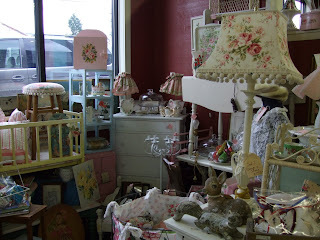 We also make and sell pillows, lampshades, and you can always find a variety of little eclectic odds and ends. We tend to buy things we like and will fit into our pastel color palete. We are both pink freaks so our name "tickled pink" fits us perfectly. We have been selling together now for over three years and we have so much fun together too. Anyway, I spent a couple hours cleaning up, gathering things for the Oregon City show we are doing next Sunday and just shopping. 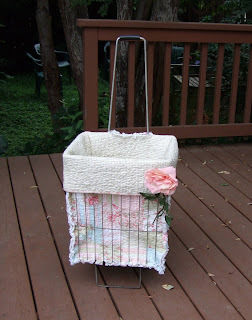 I found the cutest pink chenille bedspread, and a cool wicker basket with vintage fabric flowers. Of course I forgot to take pictures of those. 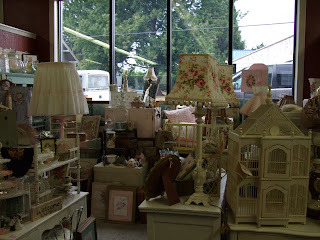 I also did a lot of thrifting yesterday stopping at three Goodwills, and two Value Villages. 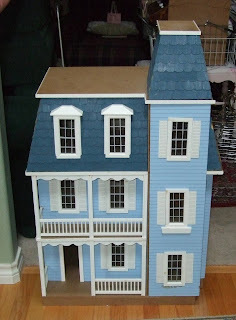 I found several cute items for resale, but the best find was this huge dollhouse. I just love it! As promised, here is the picture of the complete shopping cart and liner. It was a gloomy day yesterday and not great lighting. Believe me when I say this is so much cuter in person. If any one out there is reading this and can offer tips on getting better pictures I would be so grateful. I have a brand new Fugi FinePix F40 which is suppose to be a really good digital camera. I'm sure I should be doing something different. I guess I will just have to read the manual. Today will be spent either back to school shopping or getting ready for the Oregon City Show. It is the last show we are doing this summer. Isabel and I are just sharing one 10 x 10 booth so we are only taking whatever will fit in our cars. I hope the weather improves by then. We did this show last year and had so much fun. That's when we met Joy and Diane. Happy Anniversary! 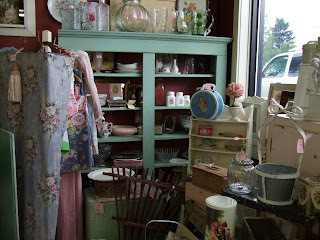 What a fun looking shop....I would have a great time looking thru all your goodies! I love your market shopping cart...especially the lovely liners, very chic indeed!